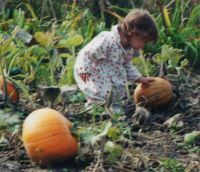 Have you ever wondered about growing pumpkins and what people do to grow the biggest pumpkins without using harmful chemicals? People have various reasons for growing pumpkins. Mine was two-fold...aesthetics and neighborhood bragging rights. My compost pile was growing wonderfully, but was not the prettiest thing to look at, so I wondered what I could do to cover it up. Then it hit me...growing pumpkins! As a result of camouflaging my pile of decomposing grass clippings I started a friendly competition with my neighbor. Who could grow the biggest pumpkin?! In all my years of gardening this was my first attempt at growing pumpkins, so the challenge was that much more exciting. The outcome at harvest time wasn’t guaranteed, and even with the slim chance that I wouldn’t win I was confident I’d have at least one huge pumpkin, if not more. You see, the secret to my healthy, hearty gardens and their abundant harvests is the pile of grass that I camouflage every year. I restock my grass pile every couple weeks, depending on how fast the grass is growing. Within that couple weeks, the bottom of the pile is black nutrient rich soil…with loads of nitrogen. The hassle of emptying the bag on the lawnmower is a small task when stacked against the rewards of having lush, fruitful gardens. At the beginning of the growing season when preparing the garden beds, I mix the soil from the bottom of the grass pile in with the ground that I just tilled. Throughout the year I alternate the emptying of the clippings between the top of the pile and the rows in the veggie garden. Putting them in the rows serves multiple purposes. It feeds the garden as the clippings decompose, it keeps the pile from growing into a mountain and it suppresses weed growth. I camouflage the pile because it’s an eyesore. Who wants to look at a pile of decaying grass when you could have the sweet eye candy of gorgeous flowers and fragrant herbs? Pumpkins grow on strong vines, and almost always have their own agenda as far as where they grow and root themselves. They make for a very interesting landscape and are quite intrusive, requiring their own space…their own patch of land. Pumpkin patch. With this in mind, the ground surrounding my pile of grass clippings was perfect (added bonus for me was the ground used by the pumpkins meant less grass for me to cut). After I was done preparing my gardens with the soil from the bottom of my pile, I simply pushed in two pumpkin seeds on either side of my pile. I was still able to add my grass clippings on top throughout the season. My confidence in growing the largest pumpkin completely came from knowing I had the best foundation, the richest mound of dirt, for my pumpkins to dig their roots into. It was hard to wait until Halloween to pick them. The neighbor and I measured them every other week. It was so fun...and funny, to walk down the street with a measuring tape, grinning. Mommy, How Big Is It Now? My children helped keep track of the measurements and that made it that much more worthwhile. It was a family affair. Could’ve been a science project had we kept track of the amount of watering, sunlight and other key elements and compared the amount of growth with those elements’ availability. It truly made carving our jack o’ lanterns a special event. In case you were wondering, the neighbor didn’t use any “special dirt”. Not any of mine at least. And yes, I had the biggest pumpkin by 5 inches in its circumference. That turned out to be a happy jack o’ lantern. No Time for Compost But Still Want a Natural Boost for Growing HUGE Pumpkins? Rich, nutrient dense soil from composting isn't the only solution for growing gigantic pumpkins. If you don't have time to do it yourself, you can enlist the help of Natural Organic Fertilizer. 1st application: Band 2-3 oz. 4-3-3 Natural Organic Fertilizer , 1-2 oz. 0-12-0 Liquid Bonemeal , and 1-2 oz. 0-0-8 Liquid Kelp & Sulfate of Potash in 1 gallon of water on 15-20 ft. of row or 4 hills at planting. 2nd application: Foliar feed 2-3 weeks after emergence with 2-3 oz. 4-3-3 Natural Organic Fertilizer in 1 gallon of water. 3rd application: Repeat 2nd application when plants begin to run. 4th application: Repeat 2nd application when the first bloom appears. 5th application: Foliar feed during fruit fill up to 2 weeks before final harvest with 1-2 oz. 0-0-8 Liquid Kelp & Sulfate of Potash in 1 gallon of water. Soil applications: Use 2-3 oz. 4-3-3 Natural Organic Fertilizer in 1 gallon of water on 10-20 ft. of row or 50-100 sq. ft.
Dan Shisko, Shisko's Country Produce Ltd.
"I sprayed aproximately five acres of pumpkins also with two applications, the first at about the three leaf stage, the second when the plants were about one foot tall. This resulted in a very good crop of large pumpkins." Don N in Virginia also found the competitive side to growing pumpkins to be very rewarding using an all natural liquid organic fertilizer. 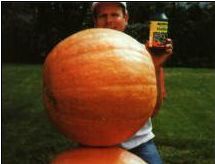 He was able to beat out the competition and win a contest for growing the biggest pumpkins using 4-3-3 liquid organic fertilizer made from fish and kelp. Where Can I Get All Natural Liquid Organic Fertilizer?